Formed in 2014, SolarIsland Energy has grown to become one of the leading renewable energy development and construction companies in the Caribbean. 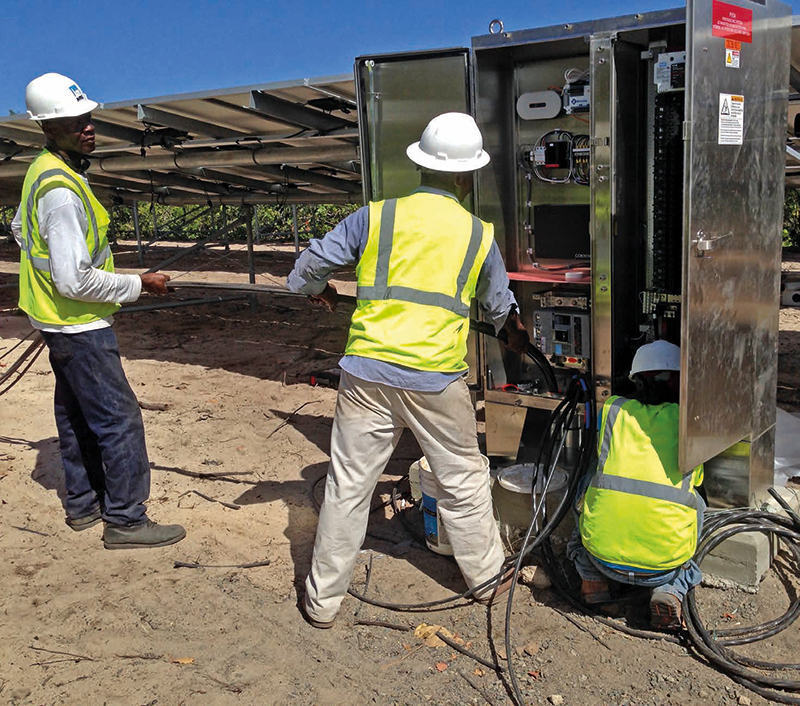 SolarIsland Energy has experience and expertise with most commercial-grade power systems, including 20,000 Enphase microinverters installed since 2009. Whether you hire us to be your turnkey design-builder, construction manager, or solar engineer, we’re comfortable integrating into almost any project team structure, delivering the same high level of safety, performance, and aesthetics. Starting with a comprehensive assessment, we calculate your power needs by studying energy consumption and peak loads on your electricity bills. Then we assess your site plans to work out available space, land boundaries, and any space or size limitations. During this process, we take into account soil and structural suitability for solar energy, microgrid systems, and wind turbine infrastructure. Our initial feasibility check is completed with estimated pricing and a business case, free of charge. With the size, cost, and business case outlined, our engineering team starts designing your project. Precise system specifications, electrical designs, and a full engineering package are provided next. Given the amount of work involved, this stage attracts a fee. Either at this stage or at the initial feasibility check we will visit your site. Upon completion, we provide a full engineering, procurement, and construction (EPC) proposal. This proposal includes a guaranteed maximum price (GMP). At all stages, full financial options are presented. With risks reduced and clarity on the scope and costs of your project, we get to work building your renewable energy solution. Our Caribbean teams and US-based engineers are all construction veterans, bringing an extra layer of expertise for your benefit. For the highest quality and the best reliability, we only recommend and use technology that meets our exceptional criteria. This ensures longevity and efficiency of your renewable energy system. At the conclusion of the build stage, with your renewable energy infrastructure and storage and control systems hardware in place, your system will be a fully tested and commissioned working system with warranties. SolarIsland Energy will then hand over systems controls and software for ongoing operation. Though your renewable energy solution is complete, SolarIsland stays involved. We care about you, your business and the success of your new system, therefore we offer ongoing technical and logistical support. This ensures the smoothest possible running of your energy system for the life of your project. Our experienced technicians are on hand to offer maintenance and technical assistance, both remotely and on-site. To assist our clients develop their solar structures, microgrids, wind turbines and other advanced technologies, our engineering team uses advanced computer simulation models such as PVSyst™, Helioscope™, HOMER™ and eTap™ to support our design work. We also have the capacity to provide various third-party financing for renewable energy projects. This includes Power Purchase Agreements (PPA) or leases, for projects ranging from rooftop solar-PV to complex island microgrids. SolarIsland is adamant about safety, quality, performance, and aesthetics. We only use licensed, professional engineers and NABCEP-certified designers and installers on staff. Everyone is OSHA trained for job-site safety; we are an industry leader with our Safety and Quality Assurance Training Program for our subcontractors. We are fully insured and bonded in excess of $10 million USD.